No, this is not one of Paul McKee's Blairmont properties. No, it was not the victim of brick rustlers. 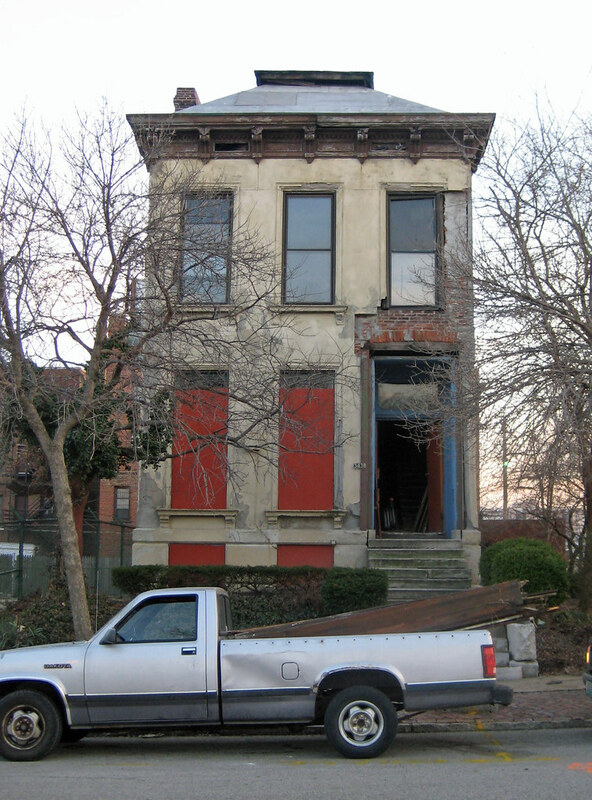 Until a last Monday this house on Hebert in Old North St. Louis was undergoing a full gut rehab, having been a formerly abandoned LRA property. So you may be asking yourself what the hell happened? What happened is possibly one of the most blatant acts of gross negligence and stupidity I have heard in a long time... over week later I am still trying to wrap my mind around this one. So the shell work had been completed, including full tuckpointing, masonry re-building in some areas, new floor joists and sub-floor, new windows, new roof, etc. and work had apparently already begun on interior finishes. Apparently there was some foundation underpinning that needed to be done. OK, I'm going to stop here and state the obvious: that foundation underpinning is something you do in small sections at a time. The foundation contractor, who obviously has a complete absence of common sense, excavated the dirt away from the rubble stone foundation all the way to the bottom along the entire east side of the house. 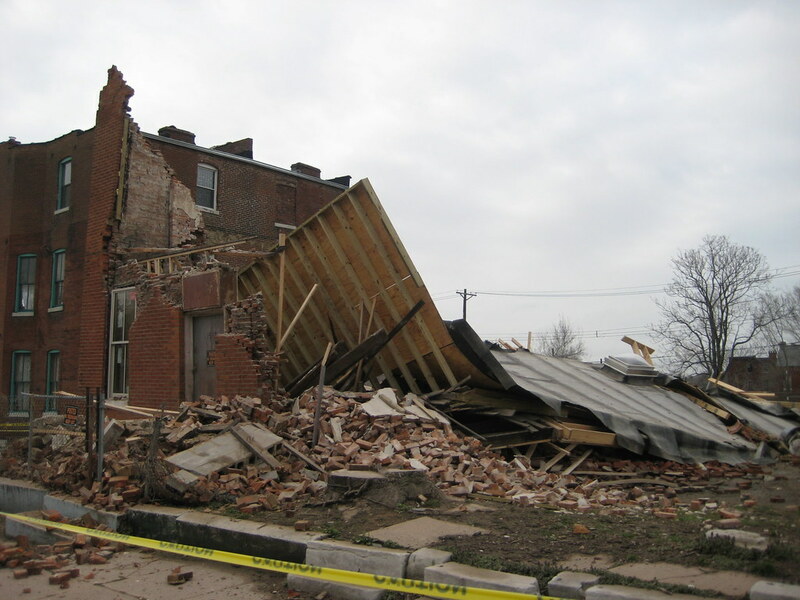 This act alone is not advisable for a 100+ year old rubble foundation, as in many cases, they need re-pointing, and exposing the entire length can make the foundation become unstable. Then he precedes to dig under the footing, and keeps digging, until...well you see the result. To make matters worse than they could have been, the the new floor joists were not simply inserted into the old masonry pockets as they would have been when the house was built. If this were the case, it is feasible that a good part of the shell would still be standing, since the floor and joists would have been able to fall away from the shell. Instead, the genius bolted band boards to the exterior walls and attached the joists to the band boards, so when a portion of one wall started to collapse, the floor structure dragged the rest of the house down with it. It is unclear at this point what will happen here, but my guess is will end up a vacant lot. 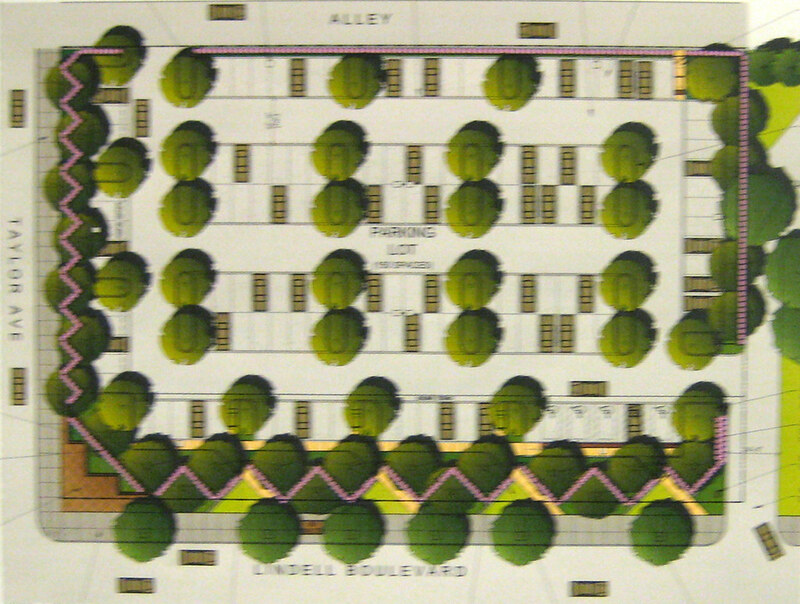 This morning at the CWEA Planning and Development Committee meeting, the architect hired by the Archdiocese of St. Louis explained that the Archdiocese wants to create a "campus" by demolishing the San Luis Apartments at Lindell and Taylor and building a surface parking lot in its place. Yes that's right they used the "C" word! As if that was not bad enough, the next words spewed from the architect's mouth were that the "campus" would make the Archdiocese collection of buildings "not a hodge podge that happened over time"! WTF! "a hodge podge that happened over time"!!?? uh... most of us call that a CITY! 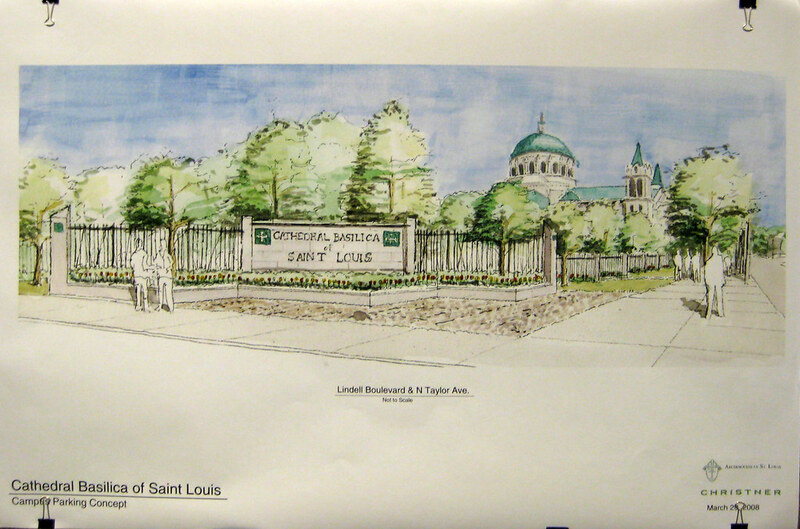 To complete the campus look, for "security" purposes, the surface parking lot would be surrounded by a SLU style black iron fence. So... will they eventually want to fence the Catholic Center, the Cathedral, and Rosati Kain? The parking lot would have 150 spaces (although about 20 of these would be lost to a request from the CWEA Planning and Development Committee request to respect the Lindell building set back line) as compared to 180 spaces that exist in the 3 levels of structured parking in the San Luis building... not exactly a net gain. The architect pointed out that the existing apartments that were originally hotel rooms are only 240 square feet. If these were combined to create actual one bedroom apartments, with some two bedrooms mixed in, the unit count could reduce from 226 to about 100. 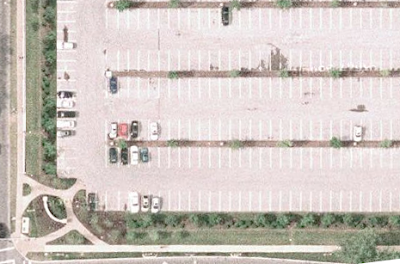 If one parking space were allocated to each still relatively small unit, there would be 80 spaces left over for daily use by staff at Rosati Kain. A representative of Rosati Kain explained their need for additional parking by staff and students. To gain additional parking without demolition, the Archdiocese could put some parking for students on the large grounds of St. Elizabeth Hall, which is directly north of the cathedral across Maryland. To minimize the effects on the grounds, they should use a product called Grasspave2, which uses interlocking plastic rings in real grass to provide the structural capacity to park on the grass. A double loaded row of parking along the Newstead edge of the property could yield about 70 spaces. The combination of this with excess parking at the San Luis would provide more parking than the current demolition proposal. This proposal will need to go before the City's Preservation Board, so it is far from too late to prevent this slap in the face proposal form being executed. The owner of the San Luis, The Archdiocese of St. Louis is proposing to demolish the building and replace it with a SURFACE PARKING LOT! This proposal is an insult to everything good happening in the Central West End and the City in general. The CWE is one of the most vibrant, dynamic and walkable urban neighborhoods in the City and one of its most visible blocks is in danger of giving way to the WORST possible use imaginable. Until recently, the San Luis housed over 200 senior citizens, who have since been kicked out and forced to find other living arrangements. The likelihood that these seniors will find comparable housing in such a convenient walkable area are slim. Is this the future of Lindell & Taylor? Please come to the meeting next Saturday and voice your opinions. Let the CWEA and the Archdiocese know that the corner of Lindell & Taylor deserves better than looking like its part of a second-rate city with no respect for itself and no aspiration to become a great city and a great place to live. Just one block south and west, the "Doctors Building" parking lot, is about to be replaced with a mid-rise apartment building with ground floor retail. While I am less than thrilled with the design of the new building, at least an eye sore that has been around for 30+ years will be gone. 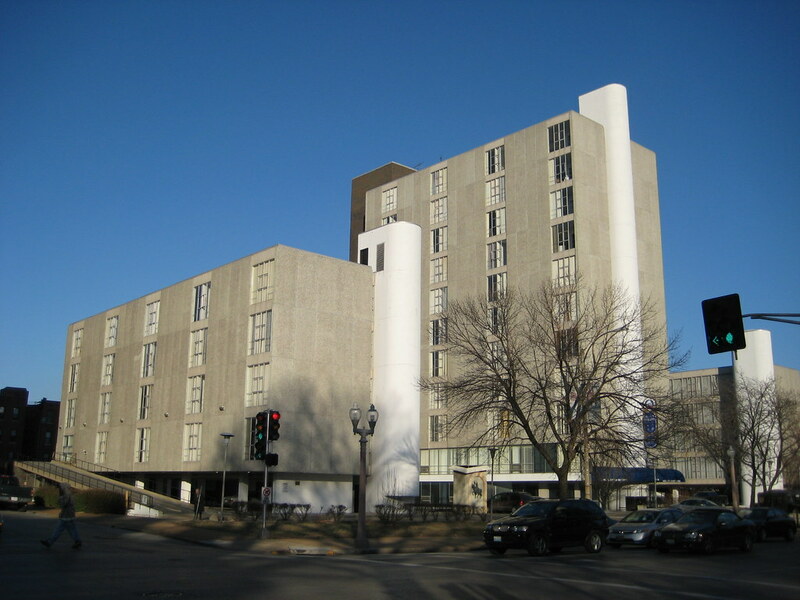 The Archdiocese has given no indication of any desire to build anything new at Lindell & Taylor, so please remember, that if this proposal goes through, we could be faced with a new eye sore for another 25 years or more, so please show up next Saturday. 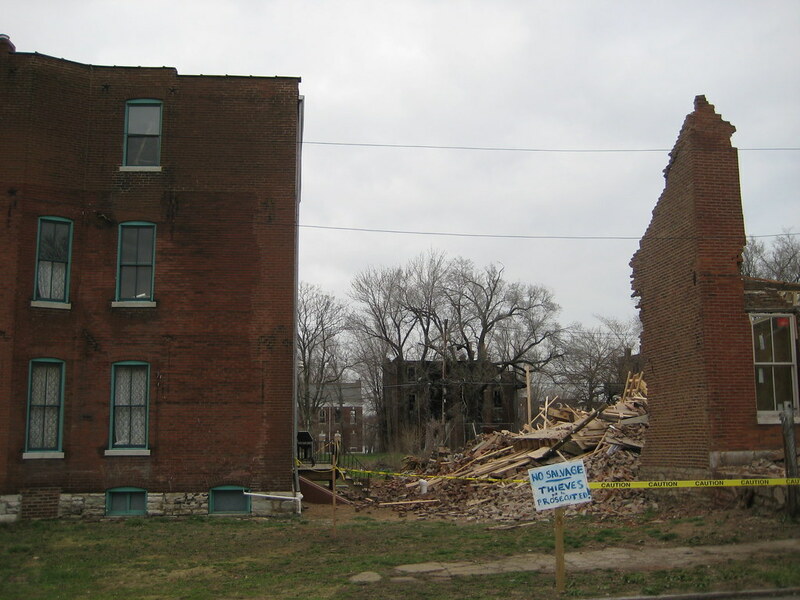 St. Louis University continues it's Midtown demolition rampage this month with the senseless destruction of the Wagner House at 3438 Samuel Shepard (formerly Lucas Avenue). 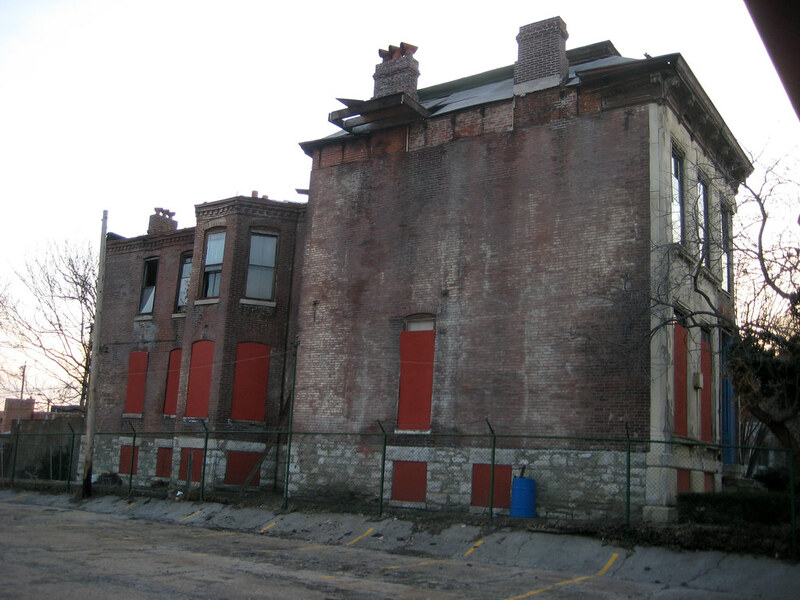 The home is one of the last stone limestone faced Italianate Victorians left in the Grand Center area, and one of only three homes left on the Samuel Shepard for several blocks east of Grand Avenue. 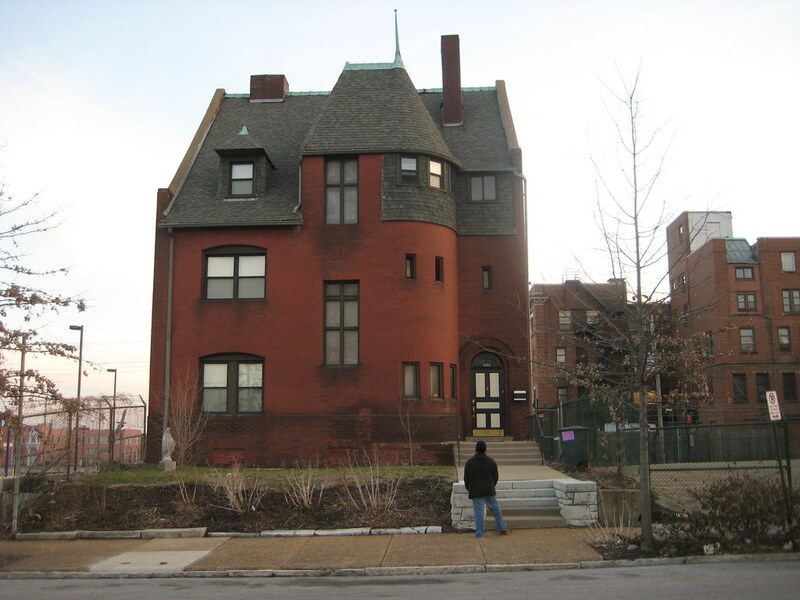 Midtown was once filled with homes like this that today are most commonly found in Lafayette Square and are also sprinkled through several neighborhoods in north St. Louis. The historic building exterminators at SLU are wasting no time with this one. 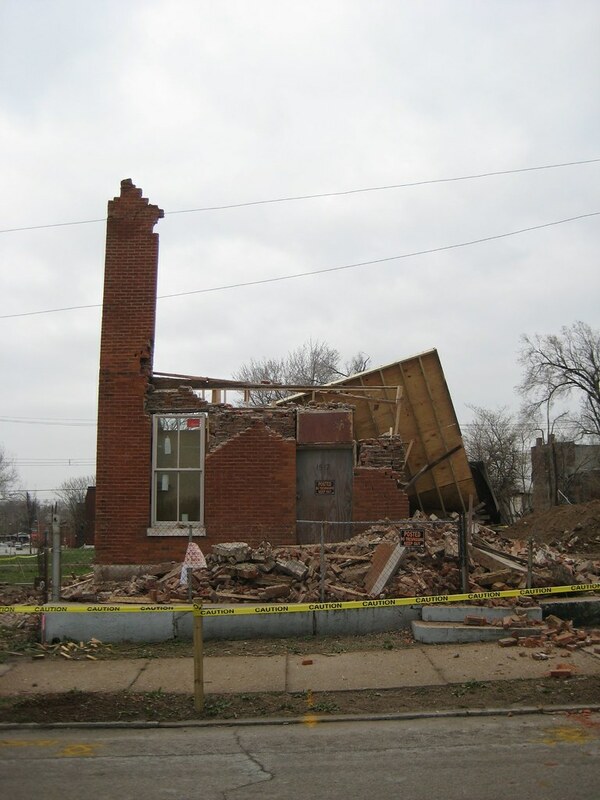 According to City records, they acquired the home on February 29, 2008, and were issued the demolition the same day! 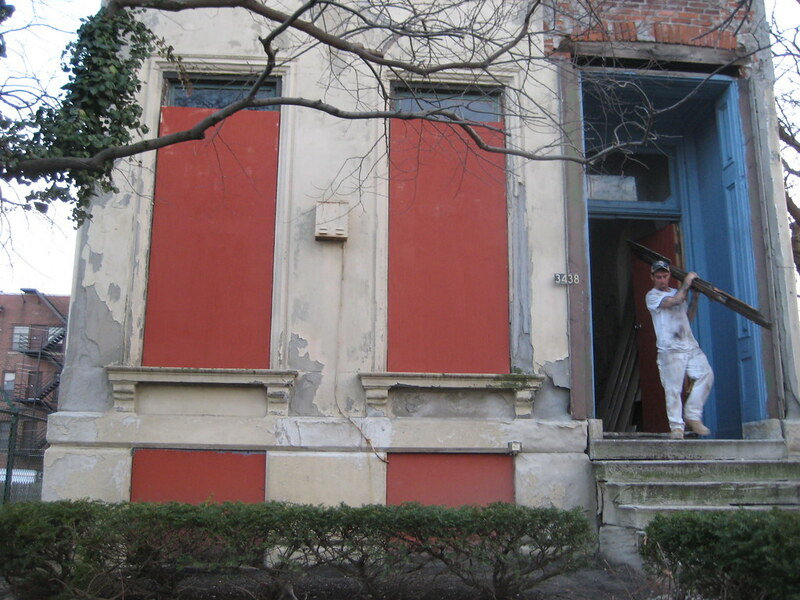 When I arrived at dusk this past Wednesday, workers were carrying out salvaged millwork. The home has sat vacant for many years, but it is still very much intact. While the roof and cornice on the east side are damaged, and a few pieces of stone veneer on the front have fallen off, the masonry structure itself shows no signs of distress. 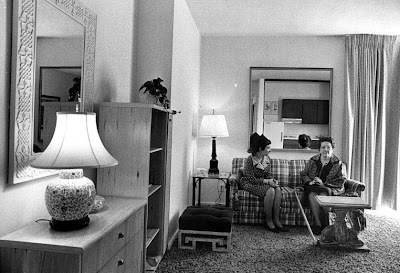 The home could have easily been put on the market as a rehab opportunity. So what will become of the site? SLU owns the small pocket park to the west and a tiny parcel containing a garage structure that sits between the house, corner lot and the alley. Will SLU build yet another parking lot!? This photo is taken from Jesephine Baker, two blocks east of Grand shows a parking lot recently built by SLU on the southwest corner. The Wagner House is in the cneter of the photo, just left of the trees. On the north side of Samuel Shepard, is a sea of asphalt extending non-stop to Grand (minus a small sculpture park and concrete block screen wall). I think the area has enough surface parking! 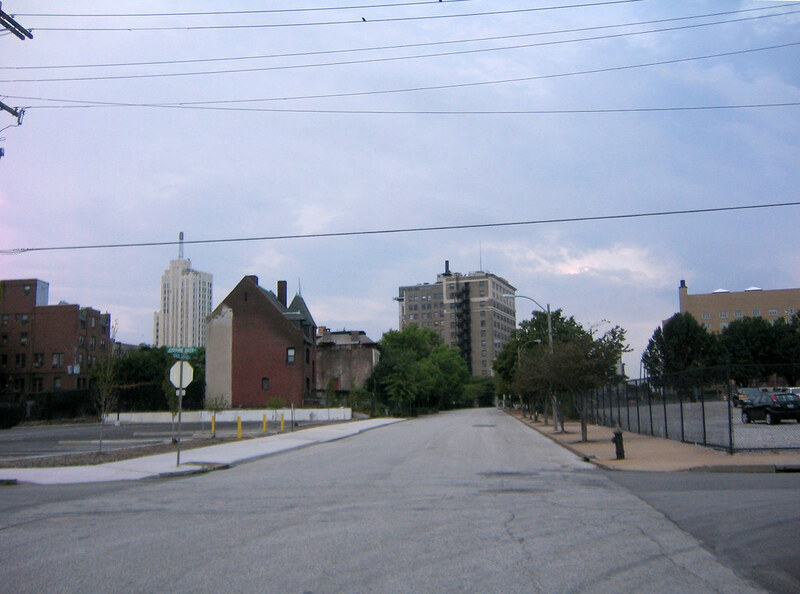 The view north of Samuel Shepard across from the Wagner house. The doomed house is not in complete isolation. 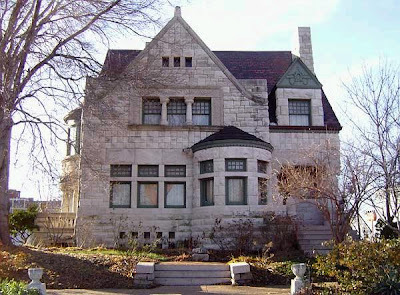 The Stockton House sits just west of Teresa next to a large parking lot where the Missouri Theater auditorium once stood and has been lovingly restored over the last few decades by architect Frederick Medler. (Photo above by Kevin Kieffer on Built St. Louis). Just east there is the impressive Ives House owned and well maintained by Father Dempsey's, who's main building is located on Washington (rear visible to the right of the house). Together, the three homes create a small oasis amid the rolling tide of asphalt that overtakes this area of Grand Center. Soon however due to SLU's continued short-sighted thinking, the Stockton and Ives will be left floating alone. 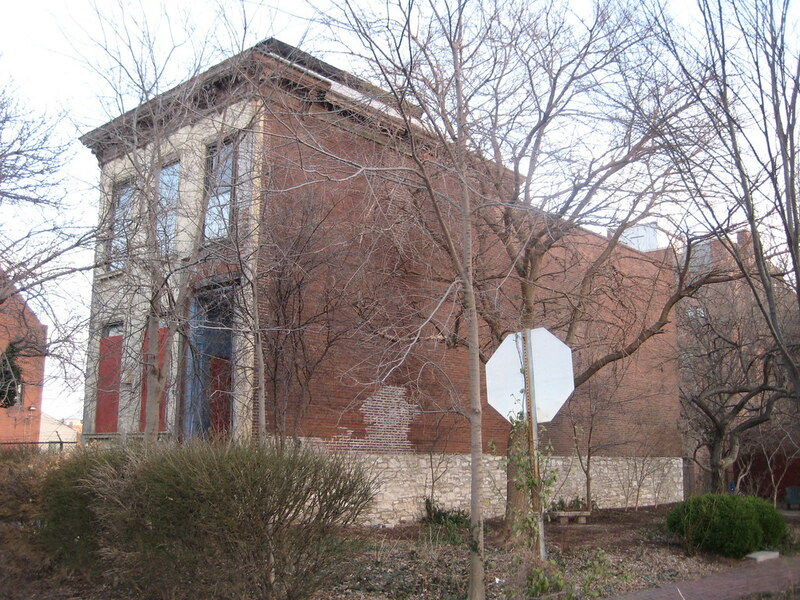 A photo of the Wagner House with it's stone veneer still intact can be seen here on Built St. Louis. My post about the recent demolition of bridges along the now closed section of Highway 40 reminded me that I had taken a few shots of the old Vandeventer Viaduct (not sure if this was it's official name) before it was demolished a few years ago. The viaduct was a relic from the early days of Highway 40, or what was then known as the Oakland Express Highway and later the Red Feather Expressway. 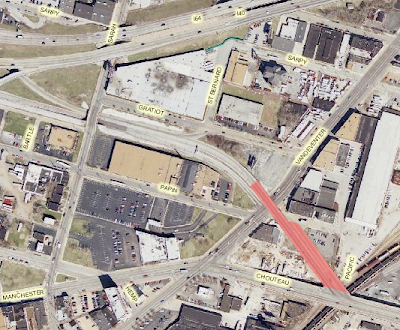 The first sections in the City were completed in 1938 and were connected to Chouteau Avenue just east of Manchester via this viaduct (see the red shaded area in the aerial photo below). Later when sections of the highway were built east to Downtown, the viaduct became more of a glorified extended exit/entrance ramp. 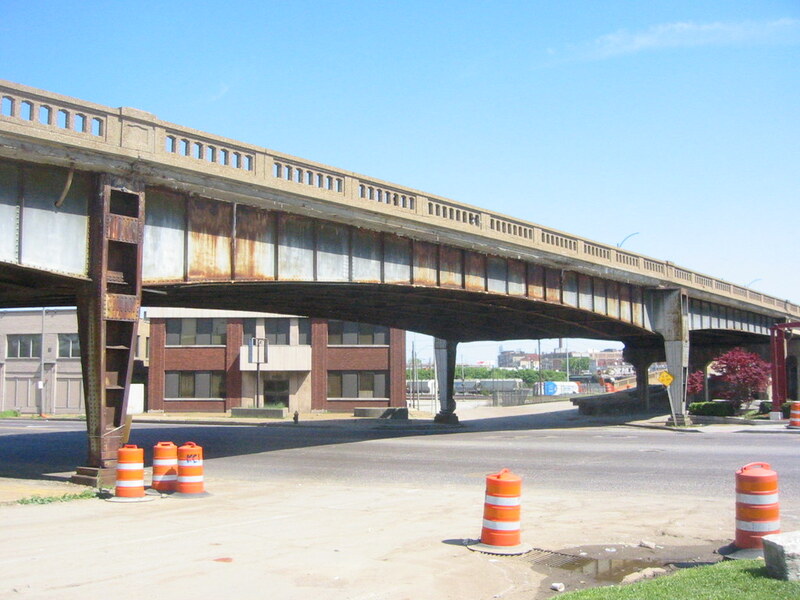 Due to deterioration and the fact that it carried little traffic, the viaduct was demolished as part of the City's project to replace the also deteriorating Chouteau viaduct over the railroad tracks. While the viaduct was neither an architectural nor engineering marvel, I was always fascinated by the detail in the photos below. 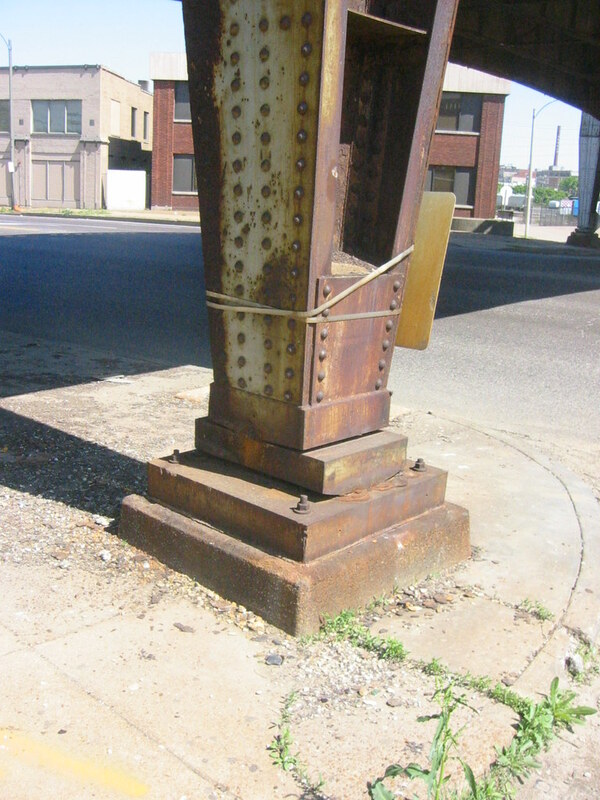 The tapered riveted steel columns terminated at the bottom with roller bearings. 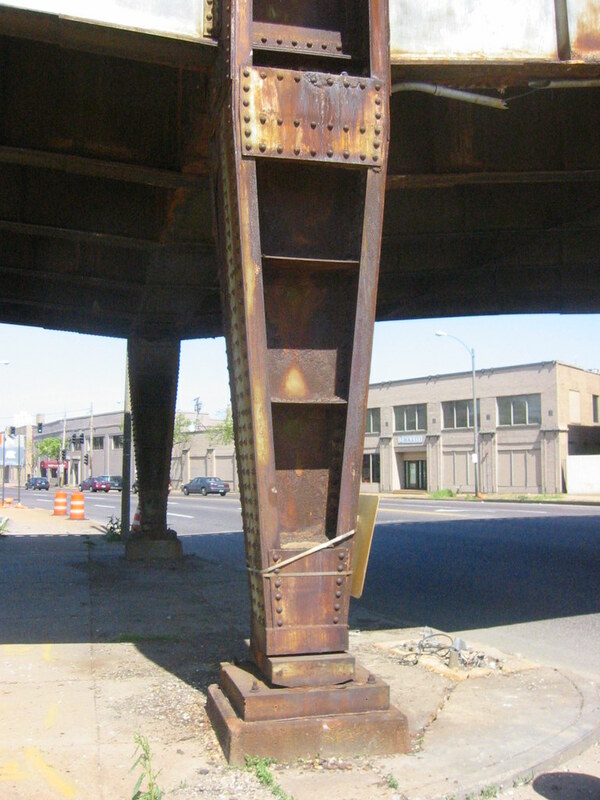 The rounded bearings connected to the columns simply sat on the large base plate below and allowed the entire column to move back and forth as the long spans expanded and contracted due to hot and cold temperatures. This is a detail that seems to never be used in new bridge construction. I suspect this is due to the fact that the unrestricted movement could prove disastrous during an earthquake. 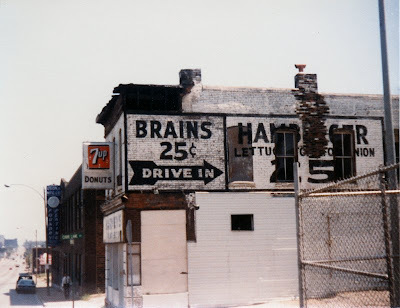 When I was a kid, we would often exit 40 and cross this viaduct to Chouteau so we could drive past what was possibly the best wall sign ever, "Brains 25 Cents", that was painted on the side of a 2 story building at Chouteau and Carr Lane, just east of Grand. This photo and other interesting photos can be seen here on Tom Spine's site. Like the viaduct, this building is now gone, and the BIG empty wasted space left where this and other buildings stood acts as a suburban style front lawn for SLU's new research building. I would like to think that eventually some of this blank lawn will be built upon with more research buildings, but I have a feeling I will be waiting for quite a while.